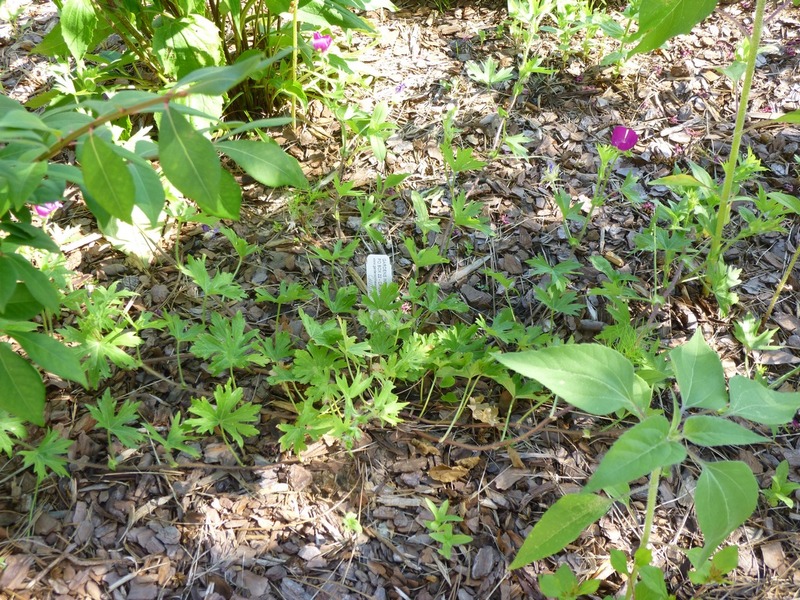 Garden of Aaron: June is Blooming Out All Over - Geraniums, Honeysuckle, Salvia, Zinnias, Monarda, Malva sylvestris, Crape Myrtle, Hypericum and more! 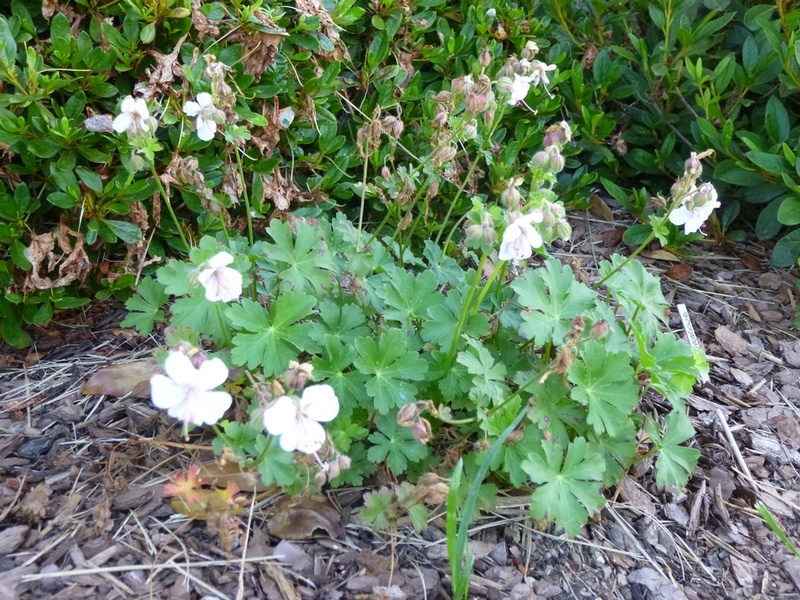 June is Blooming Out All Over - Geraniums, Honeysuckle, Salvia, Zinnias, Monarda, Malva sylvestris, Crape Myrtle, Hypericum and more! After a long cold winter and a wet cool spring, the summer heat has finally arrived in TN with temps in the low-to-middle 90s earlier this week. 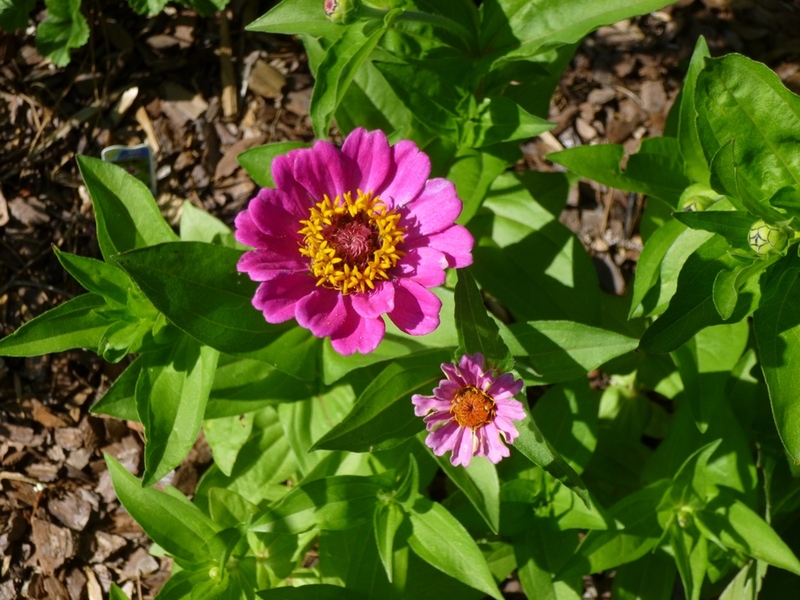 Zinnias! 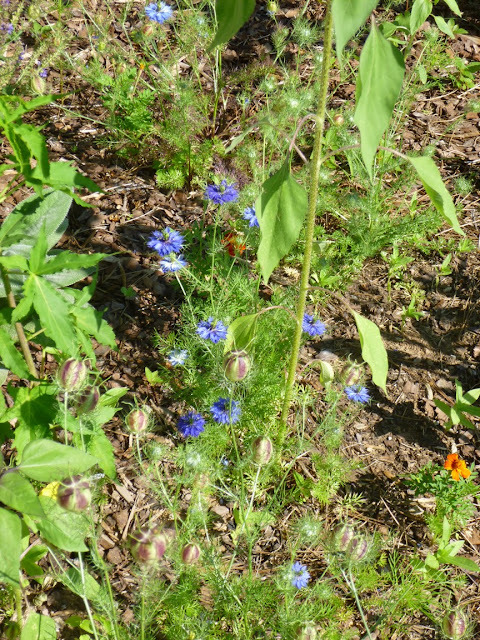 These are self-sown Z. elegans from last year. Can't remember the cultivar name. They started blooming in early June. Rozanne Perennial Geranium, sprawling, billowy and floriferous! 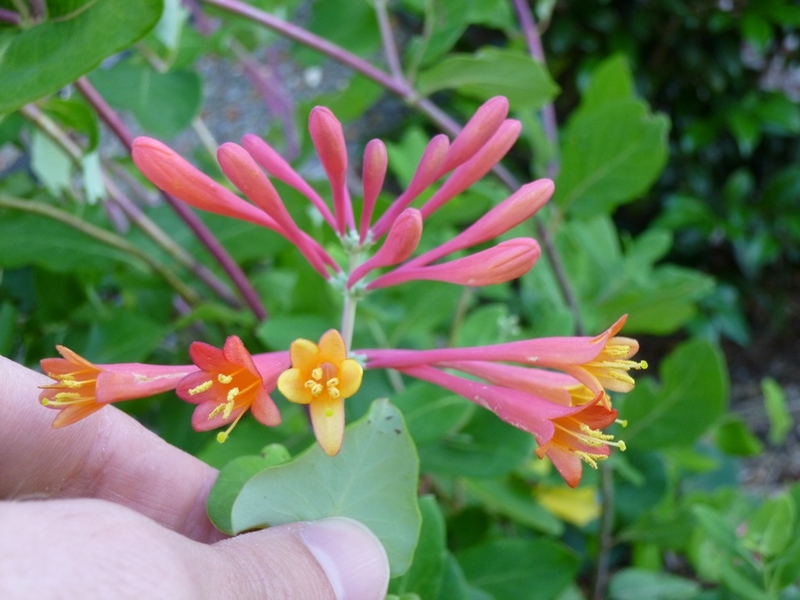 North American native, non-invasive trumpet honeysuckle - Lonicera Sempervirens "Blanche Sandman". 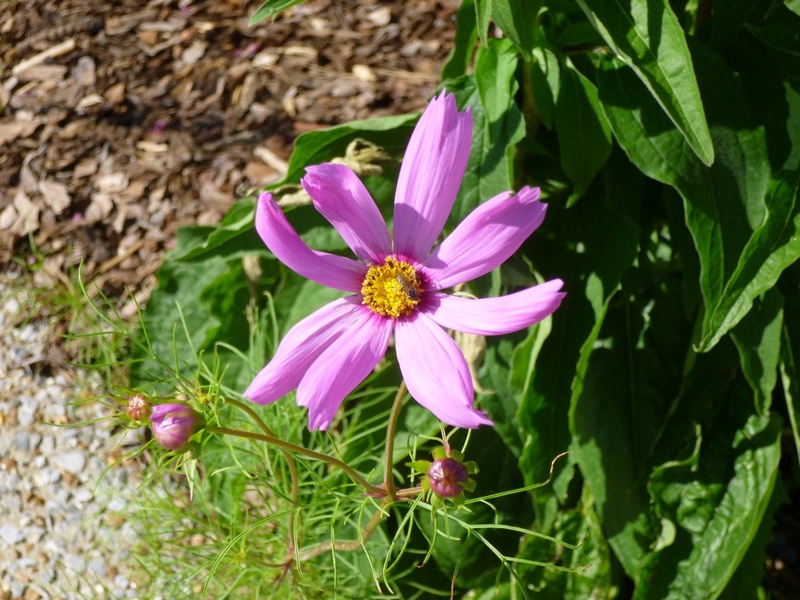 Has been blooming for months and recently has begun attracting a hummingbird sporadically. Monarda didyma "Jacob Cline" flower close-up. 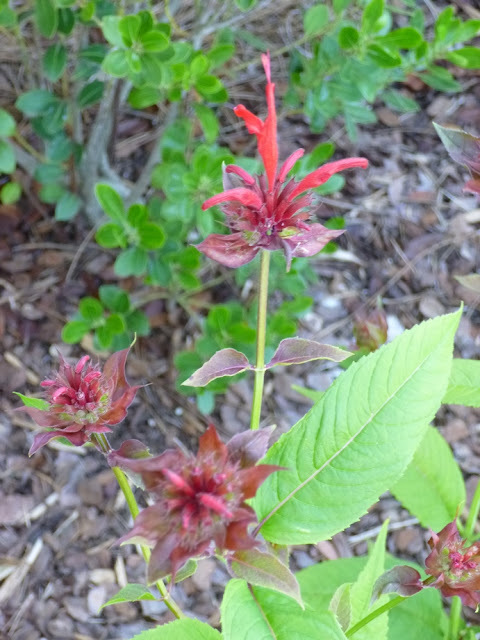 Reportedly monarda is technically edible. We tried adding some young leaves to our salad and were reminded that "edible" does not necessarily mean "palatable". 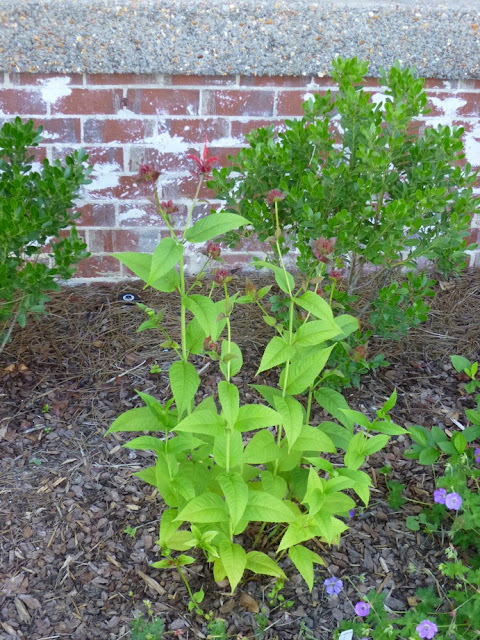 But pinching the top leaves did cause Monarda to branch out and double the number of flowerheads. Bonus! Monarda didyma "Jacob Cline" whole plant. 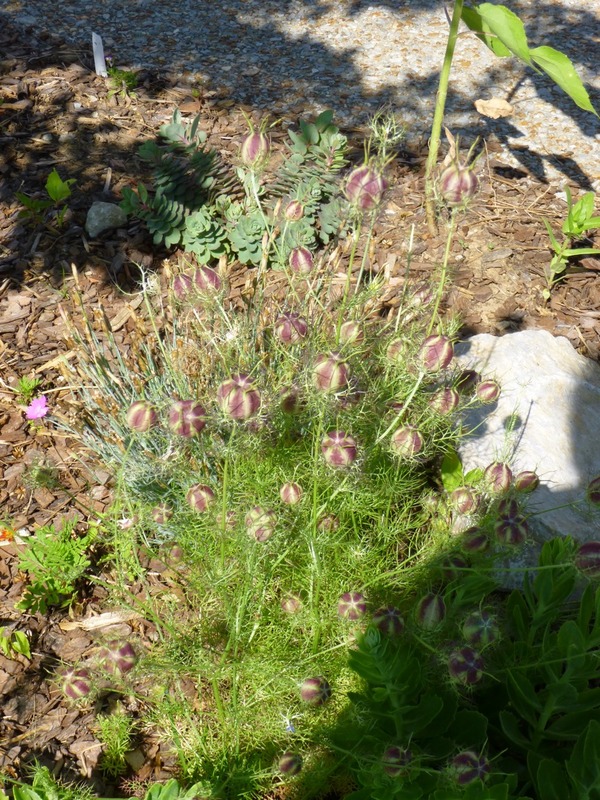 I did not contain this plant despite warnings that it could become invasive. I can see one small stem emerging near the base of the plant. I'll need to keep on eye on Jacob and will report back if he gets out of control. 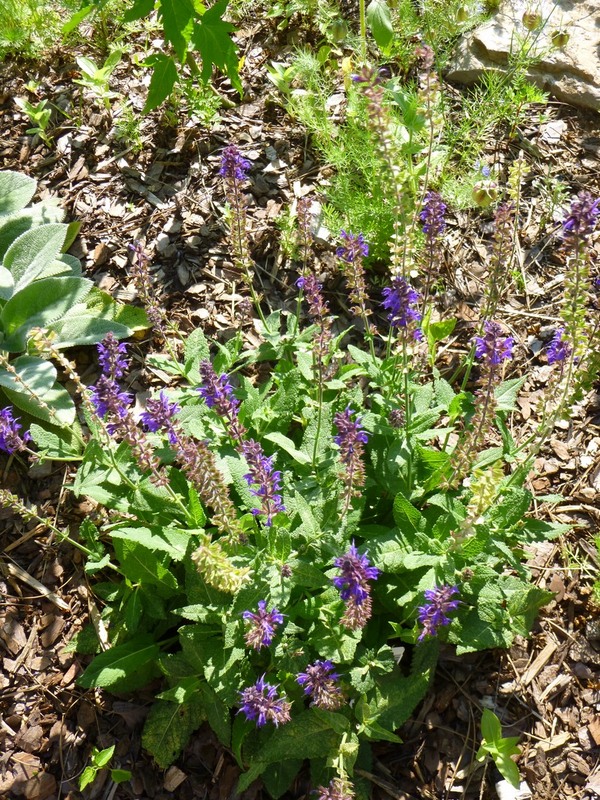 Agastache "Golden Jubilee". Happy in partial sun. 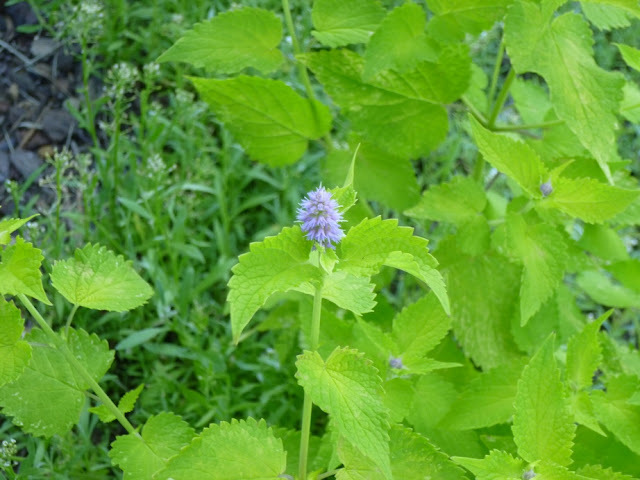 Typically agastache is supposed to like full sun, but my experience with variegated or yellow-leafed plants is that they generally need afternoon shade in TN. 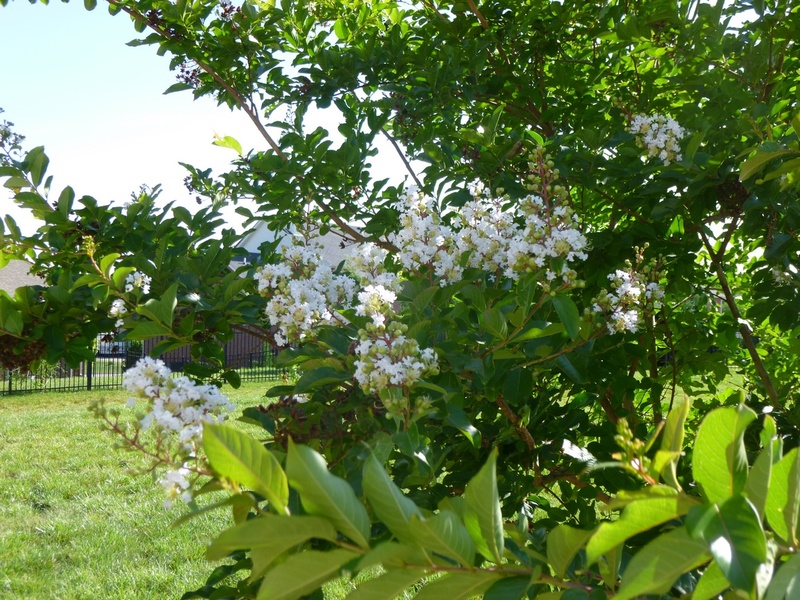 "Natchez" Crape Myrtle flowers started blooming around June 7th. I've been pleased to see bumble bees working the blooms. 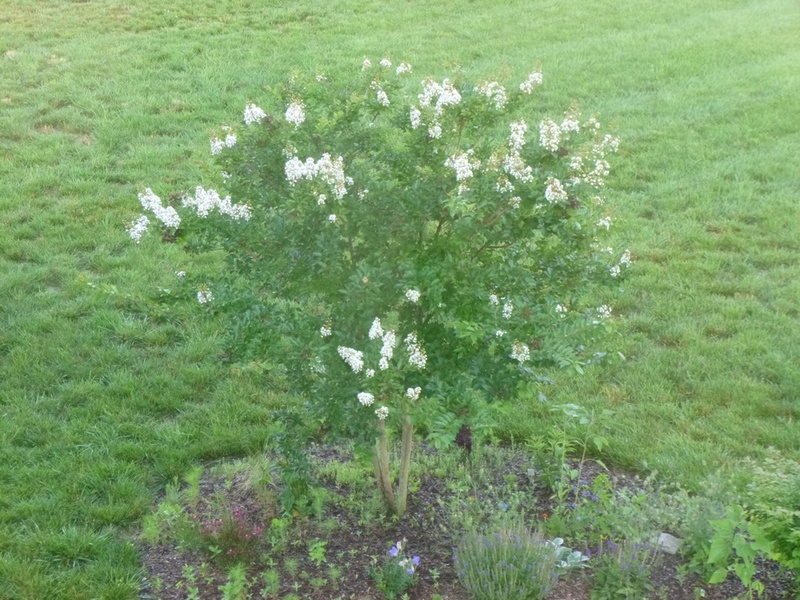 Here's an "aerial" shot of one of the Natchez Crape Myrtles from an upstairs window. I just wanted to give a sense of the flowers scattered throughout the tree canopy. 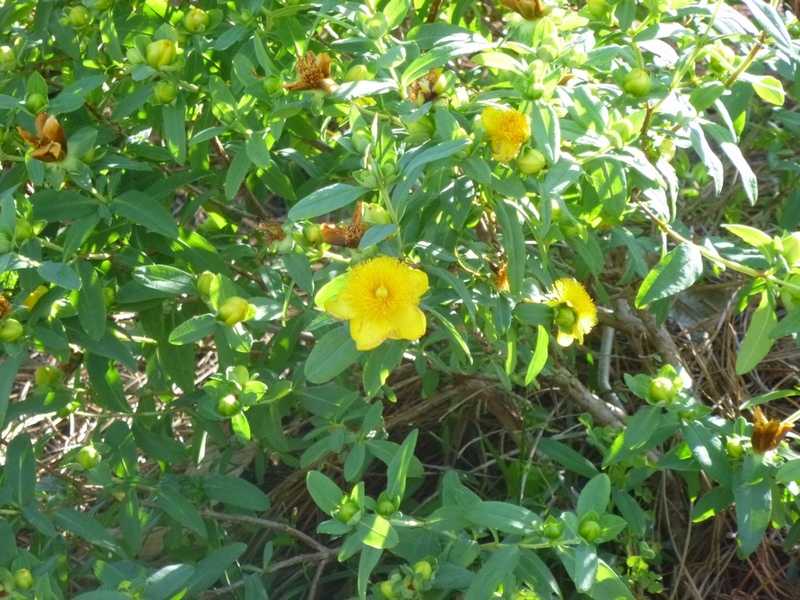 Hypericum frondosum, Sunburst, St. John's Wort. 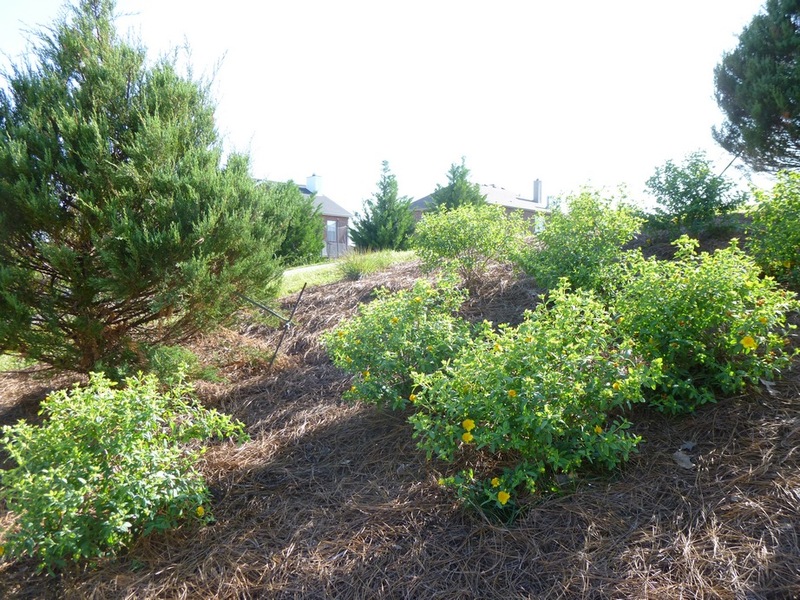 Can't take credit for these as our landscaper installed them last autumn. But I can sure enjoy them! They just started blooming around June 10th. The bumble bees seem to love these flowers~! Tagetes patula, French Marigold "Sparky Mix", these are self-sown flowers from last year. 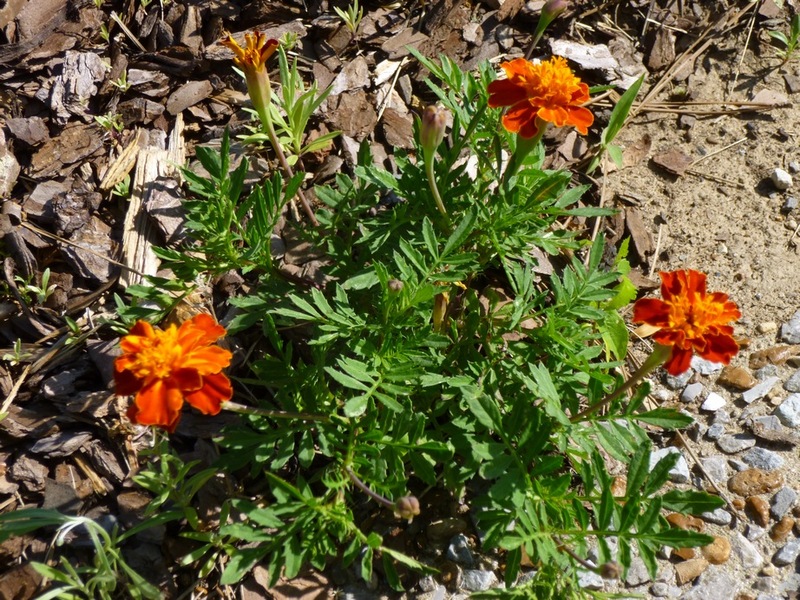 They look small now, but if last year is any indication, they'll bloom non-stop until frost without any deadheading and get pretty large and bushy by then. It looks kind of like a sprawling, not so floriferous hardy geranium, but this is actually a photo of Callirhoe bushii, a.k.a. 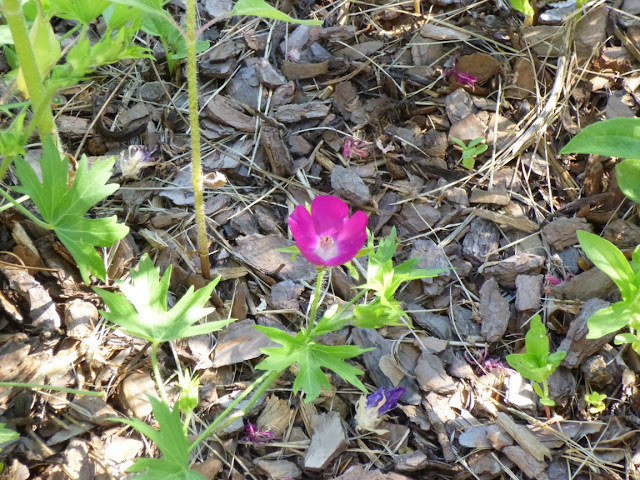 Bush's Poppy Mallow. Reportedly it has only been found at about 50 sites in the wild. It is a North American native. Here's a close-up on a Bush's Poppy Mallow flower. 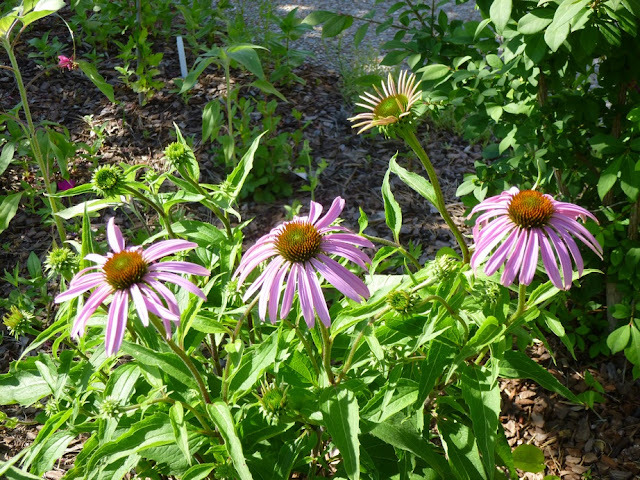 Echinacea purpurea, Eastern Purple Coneflower, a native plant to Tennessee. These purple coneflowers have been looking taller and stronger than ever this year. 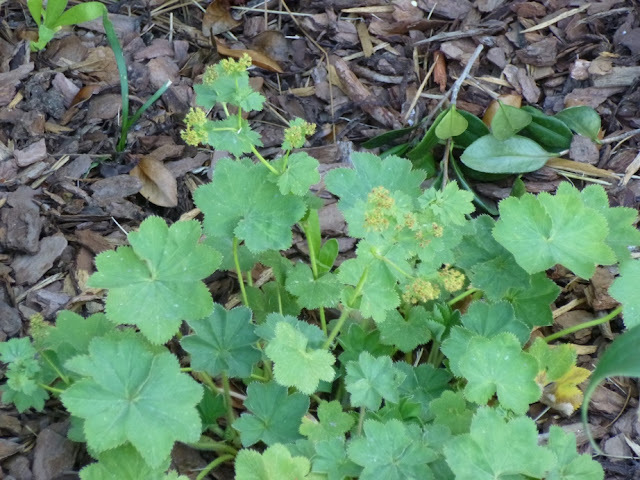 I've heard that you can propagate the plant by burying the seedheads in the autumn. I plan on trying that, because I'd love to have more coneflowers in my yard. In past years, they have attracted bees and butterflies, but I haven't seen either creature on the coneflowers yet this year. Maybe as more of the flowers open, it will get their attention? 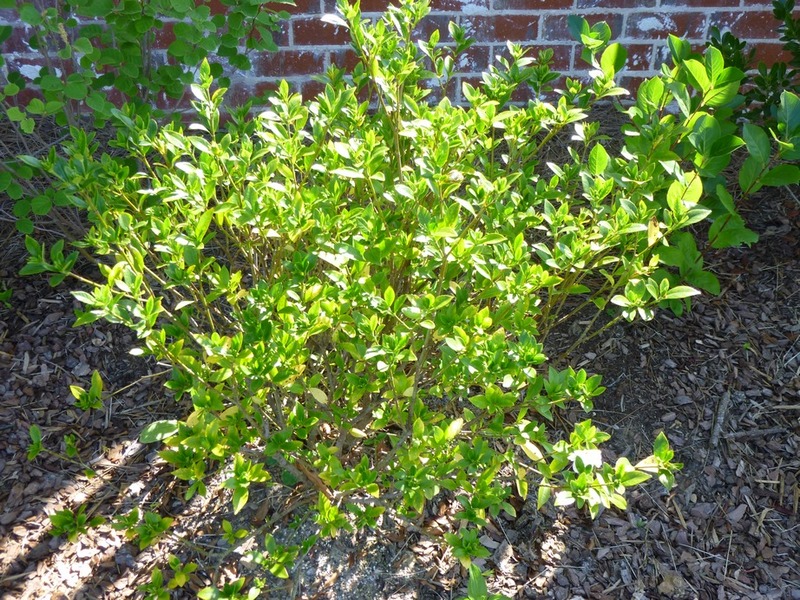 This is Gardenia jasminoides "Jubilation". It wasn't looking good 6 weeks ago and it isn't really looking much better now. As you can see, I've been having problems with leaves turning yellow and brown, then dropping off. I don't know if this is lingering transplant shock (it was planted last August), unhappiness with the cold weather we had this spring. Despite claims of hardiness into zone 6, G. jasminoides is really meant for zone 8 and warmer, whereas we're on the cold side of zone 7. Typically, I don't try to push zones too much, but I couldn't resist trying to grow Gardenia after getting a snoot full of the Gardenia perfume on a Nashville garden tour last year. 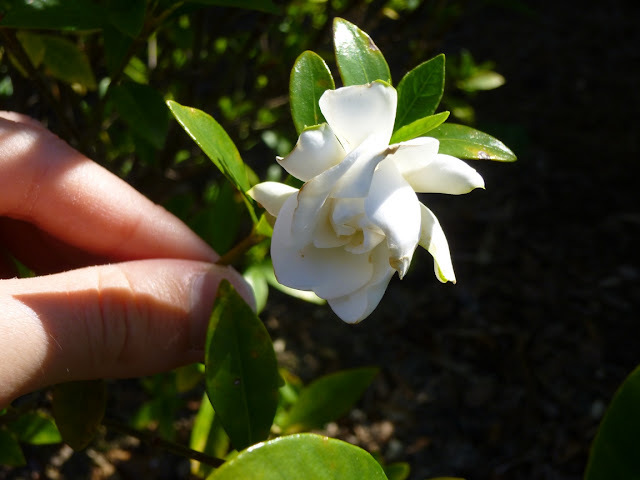 So imagine my joy when I saw this gardenia flower unfurling on June 13th! I bent down and inhaled deeply. Yes, it was a Proustian moment. Ou sont les neiges de l'antan and all that. A trip down a sweet-smelling memory lane. 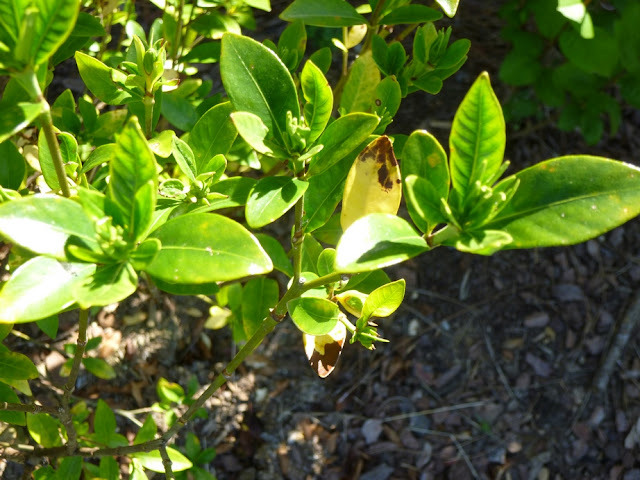 And if my gardenia doesn't pull through, at least I can say I smelled it once upon a time in my own garden. Stachys byzantina, Lamb's Ear, "Helene von Stein". OK, there are clearly no flowers in this photo, but then "Helene von Stein" rarely flowers. 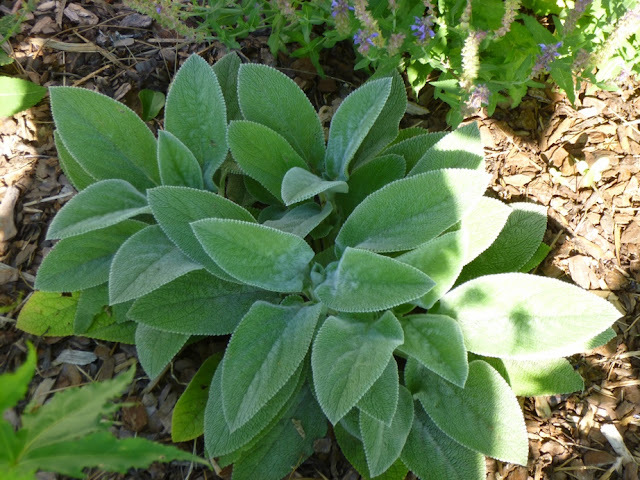 It's the soft, fuzzy, silvery leaves that are the star of the show. So far, Helene has been holding up well to torrential downpours and more recently temps in the 90s with high humidity. She's supposed to be the toughest of the Lamb's Ears. Love-in-a-Mist has mostly completed its bloom, but the seed pods are prominent and highly ornamental. In some ways, it reminds me of a collection of miniature striped beach balls! 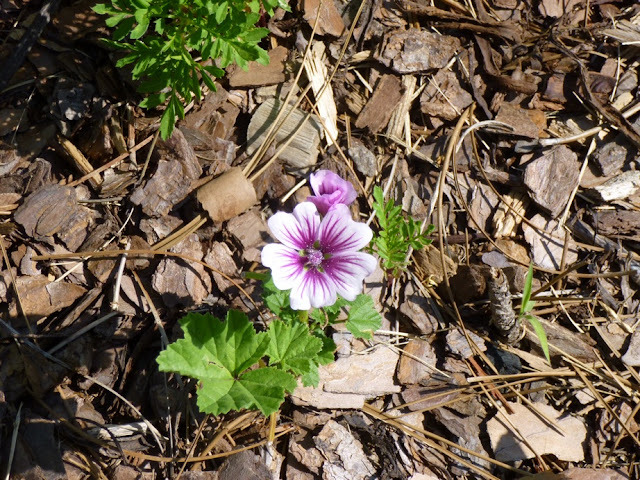 This is Malva sylvestris "Zebrina". It is a relative to the Hollyhocks. 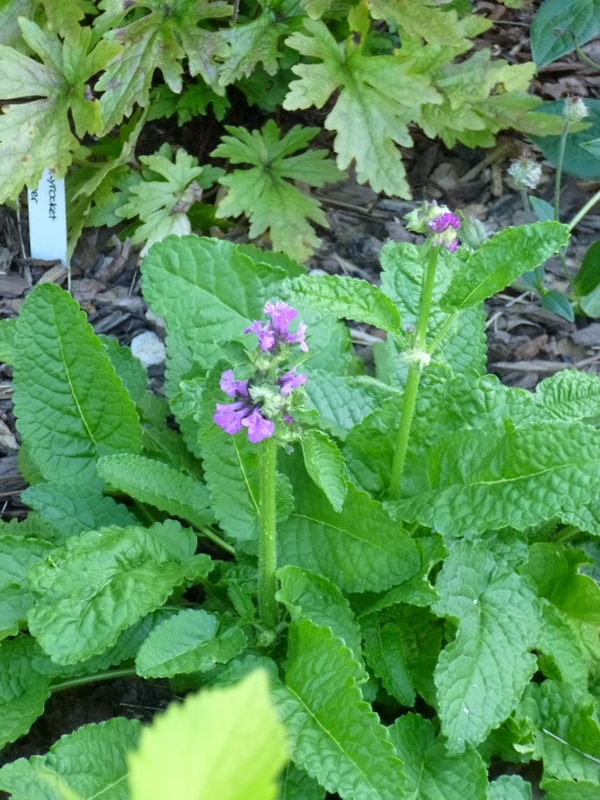 I bought two of them at the Perennial Plant Society of Middle Tennessee plant sale. Both of them - especially this one - got chomped by something. I suspect rabbits, but it could be deer. Despite being nearly decapitated, Zebrina has still bloomed! Impressive!! Beautiful flowers, although smaller than they appear in the nursery catalogs. I'd say these flower heads are about the size of a quarter perhaps. Maybe if the plant survives and grows bigger then it will have larger flowers next year? Zebrina is supposed to self-sow vigorously. We'll see if it survives to the point where it can make seeds. If the rabbits were smart, they'd let it go to seed so that they could have many more plants to chow down on next year, but I'm not sure that rabbits are into advance planning. Do mushrooms bloom? Because if so, these are blooming among some perennial - Rudbeckia? 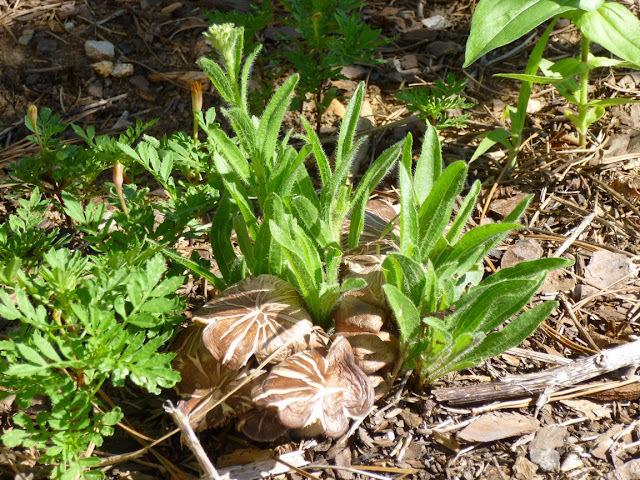 Tennessee Coneflower? 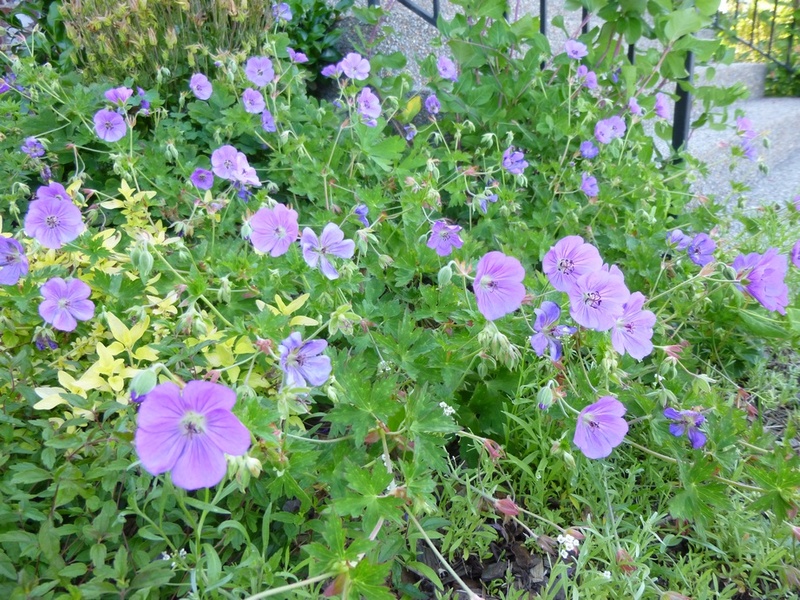 - that I planted last year and that I thought had died out. Apparently it wasn't as dead as it looked. I've no idea what type of mushrooms these are and since many mushrooms are extremely toxic to people, I gave them a wide berth. 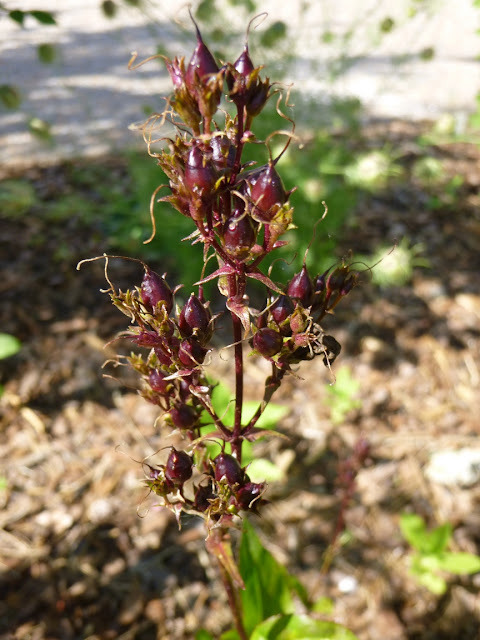 Again, not technically in bloom, but I find the reddish-purple seedpods on Penstemon digitalis "Husker's Red" quite ornamental. 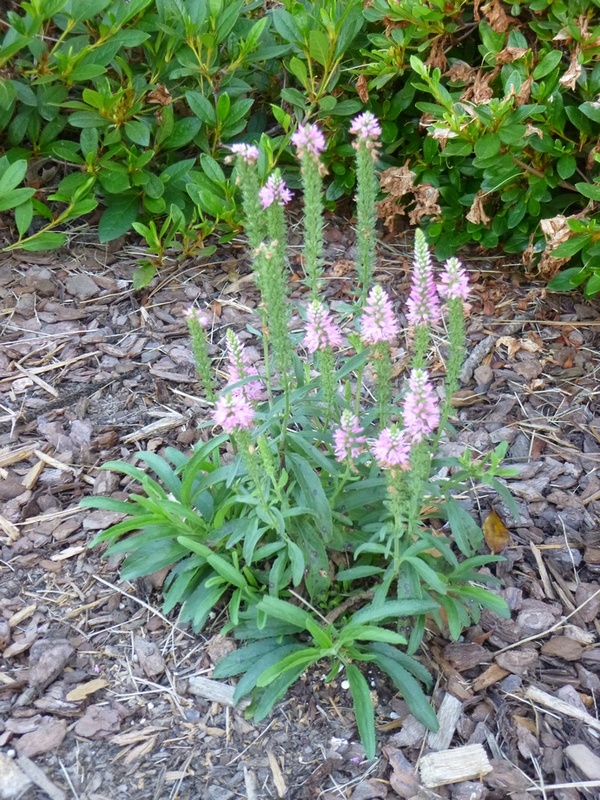 This is another perennial with a reputation for reseeding vigorously. 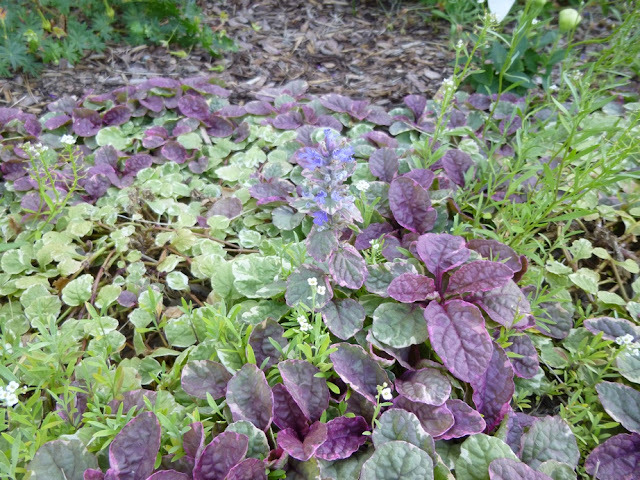 It's a little hard to make out with all the variegation on this Ajuga, but there's a pale blue flower spike in the middle of this photo. The main bloom was in the spring, but it's nice to see a little rebloom in June! Veronica spicata "Giles van Hees" has been blooming pretty much non-stop since April when I planted it. I've only deadheaded it once by cutting off a couple of spent flower spikes. I may try deadheading it again soon.